On July 16, feast of Our Lady of Mount Carmel, TFP–Louisiana launched a two week caravan to spread the message of Our Lady of Fatima. With the rise of Satanism, transgenderism, Islam and no turn around in sight, Our Lady’s message of prayer, sacrifice and amendment of life has become all the more vital. The first act of the caravan was a pilgrimage to the shrine of Our Lady of Prompt Succor where we offered to Her our actions for the conversion of America and the world. 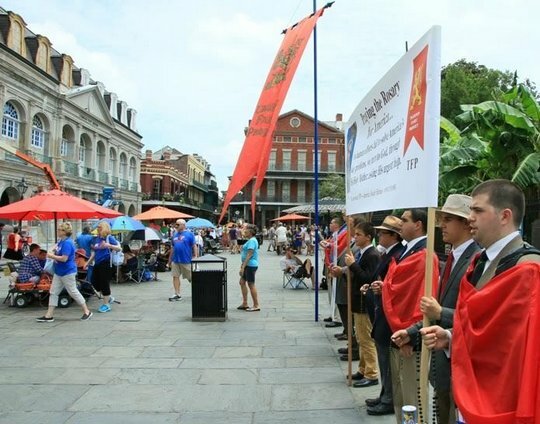 One of our volunteers consecrated himself to Our Lady, using Saint Louis de Montfort's method, and then we sallied forth for our first campaign in front of St. Louis Cathedral, in New Orleans, Louisiana. We noticed immediately upon arrival several palm readers and zombie-like fortune tellers. A jazz band blared nearby, creating a licentious party-like ambience. There were lots of tourists on the sidewalk interspersed with burned out party-goers. The latter stood out. Their faces communicated frustration and bitterness, not happiness. The fluttering standard of the TFP stood out, greatly contrasting with the tattooed, body-pierced, shabby and dirty individuals who often roam these streets. We prayed the mysteries of the rosary, sang songs, invoked the angels and saints. Some of the fortune tellers in the square were visibly bothered by the Saint Michael Prayer, and the chanting of “Viva Cristo Rey!” However, several people prayed along with us as they walked by. Others even sang with us. Later in the day we did another campaign in Kenner. The reception towards the rosary at this location was great. We attended Mass and the Gospel reading reminded us why prayer for the conversion of America and the promotion of the Fatima message is so timely. Our Lord wept over Jerusalem with the words, “Woe to thee Jerusalem, for thou hast not recognized the hour of thy visitation… My Father's house is a house of prayer, but you have turned it into a den of thieves.”We are now off to Arkansas.